Airline pilots have asked climate change protesters at Heathrow Airport to take part in "peace talks" over climate change issues. Campaigners protesting against airport expansion say they have drawn up a list of targets for "direct action". Protesters said they would be willing to have talks after the camp was over. Police said up to six arrests were made on Saturday after protesters locked themselves to the gates of an Israeli firm which flies produce to the UK. A 22-year-old man was later arrested outside the protest site on suspicion of harassment and causing actual bodily harm, police said. About 70 officers were sent to the Carmel Agrexco warehouse in Hayes, close to Heathrow. Amos Orr, general manager of Agrexco UK, said doors had been broken at the warehouse. A spokesman for the Camp for Climate Action, which is staging a week-long protest outside Heathrow, said the protesters were an anarchist group who had staged their action to coincide with the camp. Police officers monitoring the edge of the camp - between the M4 motorway and the airport's northern perimeter in west London - said the number of people arriving was growing. Organisers expect up to 2,000 people, and said 1,200 were currently there. The camp is planning a day of unspecified direct action on Sunday. Pilots say "an informed debate" about climate change would be better than the campaigners embarking on any action. British Airline Pilots' Association (Balpa) chairman Captain Mervyn Granshaw said. "We would like to come to a common understanding about carbon dioxide emissions from aircraft. "In our recent report, Aviation And The Environment, we laid out the facts that aircrafts are minor polluters, that air travel is not the fastest-growing source of emissions and that most flights, compared with other transport modes, are green. "The eco-warriors and some environmental groups disagree. We would like to meet them to try to reach a consensus, to have an informed debate," he said. 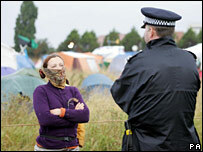 But a camp spokesman said protesters were planning their direct action and would be unable to meet pilots this weekend. Ben Healey said: "We're more than happy to discuss the science of climate change with anybody, but right now we're caught up planning for tomorrow's direct action." Balpa's report was "scientifically illiterate", he said. Earlier, protesters' spokeswoman Sophie Stephens told the BBC campaigners were going to "lay siege" to BAA's headquarters. But their grievance was with the airline industry, not passengers, she said. About 1,800 officers are to be deployed on Sunday and Monday. Police say the protesters are on the site - a sports ground belonging to Imperial College London - illegally. The campaigners insist they cannot be evicted without a court order as long as no criminal damage is committed. Airport operator BAA has obtained a High Court injunction banning certain protest groups from the airport. A fifth terminal will open at Heathrow in March 2008 and a new runway has been proposed by the government for about 2020. Is expansion of Heathrow inevitable? Does demand for travel mean airport expansion is inevitable?